EnergyCAP provides a process to import interval data for detailed energy consumption analysis. 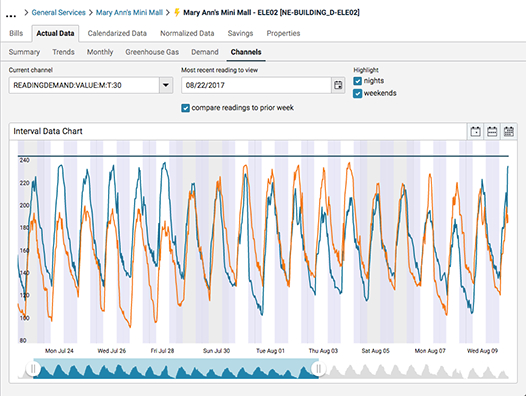 You can track electronic (“smart”) meter interval data (usually 15, 30 or 60-minute intervals), other electric meter channels (KVAR, power factor, current, voltage, etc. ), and any time-series data, including volume, occupancy, or weather conditions. Once in EnergyCAP, your interval data is available for charting, auditing, aggregating, and analyzing. You can also roll up the interval data for monthly rebill calculations and associate production with energy use to calculate, for example, energy used per hotel room visit or energy used per manufactured widget. EnergyCAP has a flexible import wizard that enables you to import delimited files from any metering system, or we can manage the import process for you via our Smart CAPture service.